1. For dressing, in a blender container or food processor bowl, combine mayonnaise or salad dressing, milk, dried tomatoes, and garlic. Cover and blend or process until tomatoes and garlic are finely chopped. Set dressing aside. 2. Place bread slices on a baking sheet. Bake in a 450 degree F. oven for about 5 minutes or until toasted. Turn slices over; spread with some of the dressing. Bake 3 minutes more; set aside. 3. 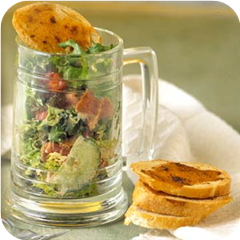 Meanwhile, in a large bowl toss together salad greens, chopped tomato, cucumber, cheese, and bacon. Drizzle with dressing; toss lightly to coat. Serve with toasted bread slices. Makes 4 servings.